A one of a kind polished stainless steel Spiral Stair. Application, motor yacht. 48" diameter spiral staircase all stainless steel polished down to a #7 finish (mirror). Evan a larger motor yacht has limited space. 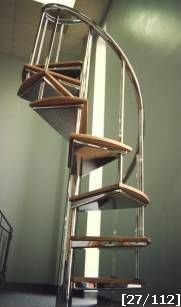 The small footprint of this spiral stairway will help solve the space problem. All welded construction, build to withstand the roughest seas. Teak wood steps and stainless steel material combine for a low maintenance aesthetically pleasing spiral stairway for a high end user.